This was the much anticipated repeat of last year’s final between Hoppers and Fylde who had contested the closest possible final in 2013, with Hoppers winning a drop-kick shoot out. Unlike last year, where there was gale blowing and it was wet and cold, this year it was a lovely day and was ideal for Hoppers’ running style. Hoppers were able to field a full strength team, excepting their long term injuries and Kieran kicked off with a high ball. Fylde fielded well and had the better of the early exchanges in the forwards. The pressure from Fylde led to Hoppers giving several penalties away, and thoughts of last year, where we were outplayed in the forwards, sprang to mind. Fylde made several dangerous attacks and excellent defense from our backs, specifically good tackles from Harvey and Tom in the centre kept them out. Fylde were particularly strong down their left flank, and great tackles by Nathan and Kieran were needed to ensure Fylde didn’t go ahead. Fylde had clearly set their game plan on a strong start and they pressed and pressed, but hoppers repelled them. Hoppers, though, started to get into their stride after a slow start, and with Tom N distributing well from scum Half, there were some dangerous runs from Duggie and Kieran, and Harvey was unlucky not to make a clear break on the left wing after some slick backs play. The forwards also now started to win ball and after a solid scrum ball a great break from Ben led to a penalty near the Fylde line. We took the penalty quickly and Dunny took the ball forward well, feeding Tom W who went over to score. 5-0, conversion missed. Hoppers were now playing to their potential and were putting phases together, with the forwards winning decent ball, despite strong play by Fylde. Hoppers soon scored again with a brilliant try from the backs. The ball was moved well with good runs from Duggie and Tom putting Nathan away on the right. When he was stopped in midfield on their 22, the forwards won quick ball and after 2 more phases Kieran put win a long pass on the left to Duggie who powered over to score. 12-0 with a brilliant conversion from Kieran from wide out on the touch line. The two tries seemed to knock Fylde’s confidence, and soon after Hoppers scored their third try following a great period of play. Fylde were now being put under pressure and were penalized for a crooked feed. We took a quick tap and fed the ball through the backs to Harvey who straightened the play, knocking over players to make good ground. The forwards provided more quick ball and the ball was moved to the left to Kieran who scythed through the defense to score under the posts. Kieran converted his own try to make the score 19-0 at half time. The first score after half time was always going to be important, as one more from Hoppers would mean they were probably home and dry, one from Fylde would mean they could get back into the game. Unfortunately for Fylde, Hoppers scored straight from the kick off. We fielded the ball well and Callum, despite being pressured by their back row, set up the ball well. Kieran broke into midfield before being stopped and fed the ball to Duggie. We recycled possession and fed the ball to Tom W, then Harvey and Ben before rucking quick ball and getting the ball to Kieran in mid field, who dummied, cut inside his defender then scored in the right hand corner. 24-0 conversion missed. Fylde did not give up, and hoppers had to defend well still, with Harvey being outstanding in defense all day. Fylde were still attacking well through their backs, but Kieran was excellent at full back, not only stopping attacks but often starting counter-attacks for Hoppers as he defused the danger. On one such occasion, he caught a Fylde attacked, ripping the ball and seting up a Hoppers move, which just failed to add to the score as the ball went to ground. A few handling errors kept Fylde just in the game, but the result was put out of doubt with the next score. A brilliant try followed a move that involved just about all the Hoppers players, with Harvey starting it off with a strong run and Adam M, Harry, Lewis, Sam W and Tom W who got the ball to Duggie who then ran in under the posts for his second of the day. Conversion made by Kieran, 31-0. Hoppers were dominant now, but Fylde did not give up and had a number of attacks repelled by the strong Hopper’s defense. Hoppers ran in a further try after foiling a Fylde move were they should really have scored, but bombed the pass and Kieran fielded the loose ball to run from our 22, outpacing the cover to score his hat trick. 38-0 with Kieran getting yet another conversion. Hoppers added another try after great work by Harvey put Duggie in for his hat trick. 45-0 with the conversion made. The final try came as Fylde tried to run the ball from their 22 and pressure by the backs made them spill the ball and Tom W got his second to make the score 50-0. The conversion was missed to make this the final score. 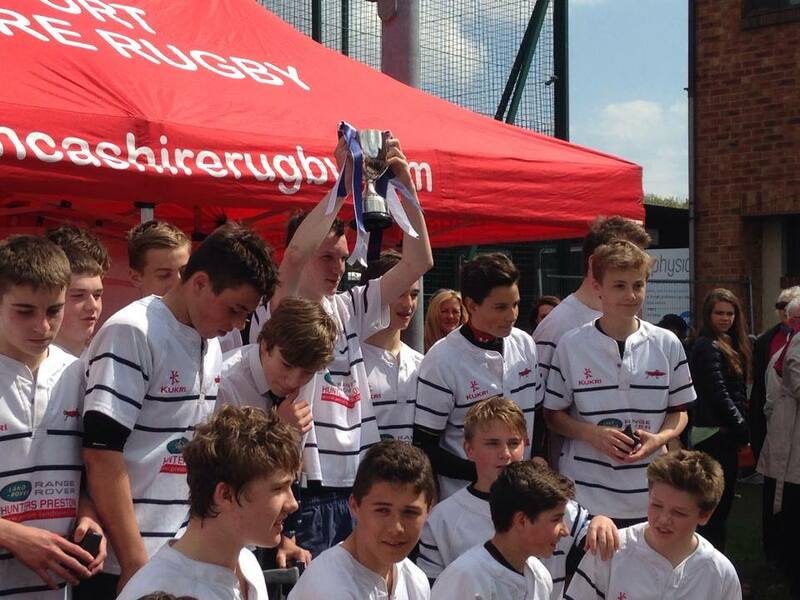 Hoppers U14s celebrated their fourth Lancashire Cup win in a row, after an unbeaten season, and all the squad should be proud of what they have achieved this season. They can now look forward to the tour of the West Country next week and some well earned fun before the end of the season.